You are here: Home / Random Thoughts / Random Thoughts / What’s the Big Deal About Easter? It doesn’t get as much splash as other holidays, but it can hold its own! We need to give Easter a little help. It just doesn’t measure up to Christmas. Of course, how can you compete with lighted trees surrounded by brightly wrapped gift packages? with the smell of roses, boxes of chocolate hearts, candy hearts, exquisite cards—all declaring love. So maybe we should spruce Easter up a bit. If we could get some really cool celebrities to get behind it, Easter might mean more. It seems whenever we have a devastating tornado, tsunami or earthquake that takes out a city, the celebrities rush to get involved and make a difference. So if we could get Jennifer Lawrence, Chris Pratt, Taylor Swift and a few of their friends to really embrace Easter, we’d be off to a great start. And we’ll recruit some athletes, of course. Serena Williams, Lebron James and Steph Curry can get us started. 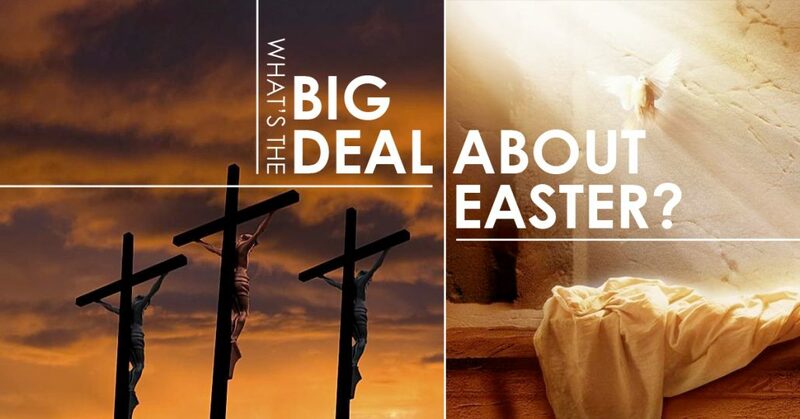 Imagine all of the above promoting Easter on television ads! Yes. If we can get the celebs, the athletes, the models and a creative marketing plan, Easter might have a chance! I’m glad it’s not up to us to make Easter popular. Easter was never created to be popular. You see, even if we could get the celebs to promote Easter . . . if the celebs haven’t experienced and embraced the Cross the way Christ did, what good would it do? The truth is: God doesn’t need any celebs to take on Easter. He doesn’t need help promoting it. He doesn’t even want help promoting it. He doesn’t want people embracing Easter for the wrong reasons. He wants true followers. The God of color and rhythm and the Grand Canyon and kangaroos and gravity and Niagara Falls and sound and lightening and donkeys who talk and hyenas that laugh could have created an amazing marketing strategy to promote Easter. But He’s not into marketing. He doesn’t think strategy. He thinks love. Unless—they’ve experienced first-hand the death of Jesus for their own sins. You see, once a sinner realizes that Jesus willingly picked up the Cross and died in her place, she’s overcome with joy and love for her Father. She wants to live for Him, obey Him, serve Him, follow Him, die with Him. Jesus told everyone to count the cost before deciding to follow Him. (See Luke 14:25-30.) He reminds us that a contractor doesn’t start to build a house without first counting the cost of all the materials. If he doesn’t do this, he may only build half a house and run out of money. You see, Jesus isn’t looking for half-hearted followers. He’s not interested in being the next big fad. He doesn’t recruit with a polished benefits package. That’s not the way He works. He’d rather have 12 sold-out disciples than an entire world that’s only talk. The only way to God (and to live forever in heaven) is through Jesus (see John 10:10). If you stack Jesus against all the other gods, none of them even compare with Him! Think about it: In all other religions, you have to work really hard to reach your god. You have to pray so many times a day, or sacrifice so much, or travel thus far or . . .
All other religions show man reaching up to their god. ONLY Christianity shows God reaching down to man! Wow. Read that again, because it’s mega-powerful. ONLY Christianity shows God reaching down to man! Christianity is the only religion that offers free salvation. You don’t have to earn it. You can’t pay for it. You’ll never be good enough to deserve it. So God reaches down to YOU by sending His only Son wrapped in human flesh to die an ugly death on the Cross for YOUR sins. Many of you reading this have already accepted Christ as your Savior. You’ve already asked Him to forgive your sins. (If you haven’t done this, you can do it right now. You can tell Him you’re sorry for disobeying Him, ask Him to forgive you and place your faith in Him.) But many of you reading this right now really want to go deeper in your relationship with Christ. We call this Lordship. If you desire to give Christ your all, you can pray this prayer. No, it’s not a bunch of magic words. You really have to mean it. And God will know if it’s genuine. Thank You for forgiving my sins. I’m so grateful that You died for me. I love being a Christian. But I want to go deeper. I want to give You everything! So right now, I’m choosing to die. I’m dying to my will, my dreams, my way, “me first,” my future. I want You to be LORD of every area in my life. I’m moving to the back seat; You’re now in the driver’s seat. You’re in complete control. Please release the power of Your Holy Spirit within me and enable me to live a holy life pleasing to You. I love You, Jesus. Amen. If you prayed that prayer and meant it, this Easter will become something brand-new to you. More than just another holiday, it will be your love response to a God who’s crazy about you. He doesn’t need a few celebs; He needs YOU. I’m not speaking anywhere this weekend. I’m enjoying soaking in the Truth of Easter in my home church in Bethany, Okla. But next weekend I’ll be speaking in Brookings, OR and would love to have your prayers behind me. Love you all! http://susieshellenberger.com/wp-content/uploads/2017/04/BigDealEaster.jpg 628 1200 Susie Shellenberger http://susieshellenberger.com/wp-content/uploads/2016/04/susielogo-300x93.png Susie Shellenberger2017-04-13 14:28:112017-04-13 15:36:04What’s the Big Deal About Easter? I enjoy Easter so much. The blessed hope, reassurance, that because he lives we shall live also. The pure joy of knowing that I will not only see my Mom again but get to spend eternity with Jesus and my Mom and my fiancée who passed suddenly from s massive heart attack. It is joy unspeakable! Thank you Lord. In the Catholic church, Easter is the most important celebration of the year. Why? Because it encapsulates the entire reason for being a Christian: Not only did Jesus DIE for our sins, he ROSE AGAIN on the third day. It’s the Resurrection that’s the most important part of Easter. You barely mentioned that, only at the end of your post as if it was an afterthought. Easter is about death, yes, but it’s even more about life, life eternal. Easter is the best because Christ died for our sins so we can have eternal life. That’s huge!